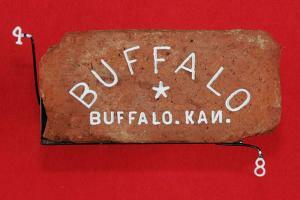 • Maker : BUFFALO BRICK CO. 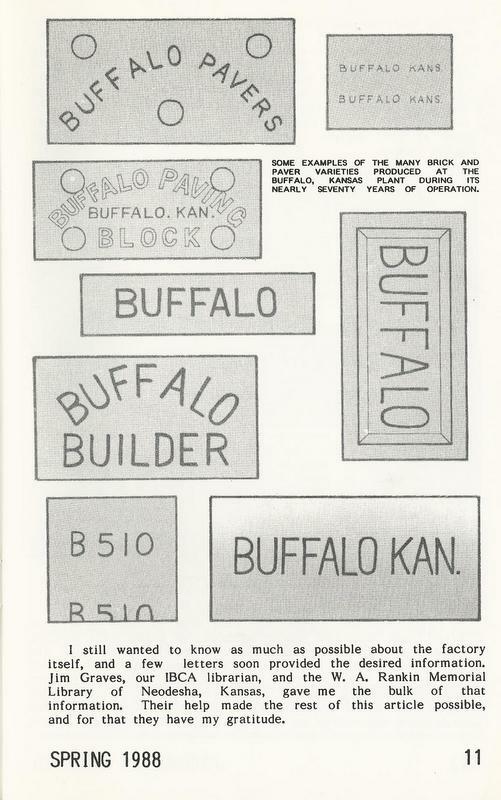 The Buffalo Brick Plant had its beginning in 1901, as the Iowa Corporation, but did not produce brick until 1902. H. J. Huiskamp was the president and owner. The first brick off the press was given to O. P. Clough, grandfather of Maynard Clough. The plant had a capacity to produce 100 to 125 thousand bricks daily. It employed between 75 and 100 men. At that time, the plant was the largest brick plant west of the Mississippi River. The red building bricks were judged to be #1 quality and were shipped all over the United States. The bricks were dried for three days in drying tunnels at 200° fahrenheit, then moved to kilns where they remained six or seven days at 1800°F, then cooled for three days, so that they could be handled. At first the heat was supplied by coal and later by natural gas. The plant produced paving, face, common and hollow brick and tile. During the thirties, the plant was operated at about 25 percent of capacity. This was due, in part, to the Depression. 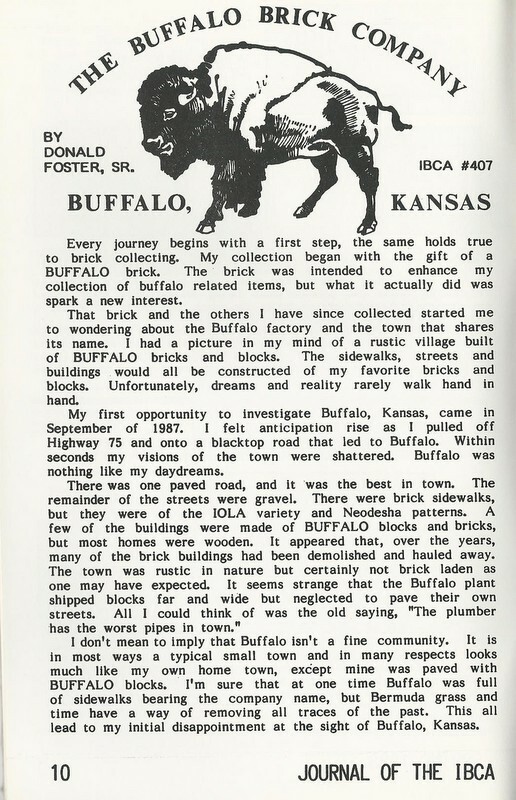 In 1939, Harvey N. Offenbacker, Jr. helped to organize Buffalo Brick and Tile. He was secretary-treasurer and H. Craig Graham, Chanute businessman, was president. Offenbacker was general manager for eight years. 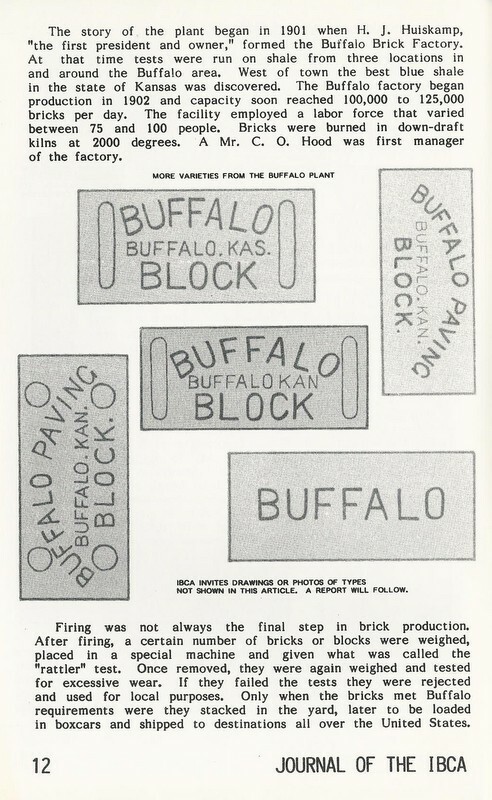 In 1954, Acme Brick Company of Ft. Worth, Texas leased the plant. It ceased operations in 1966 and was demolished in 1972. 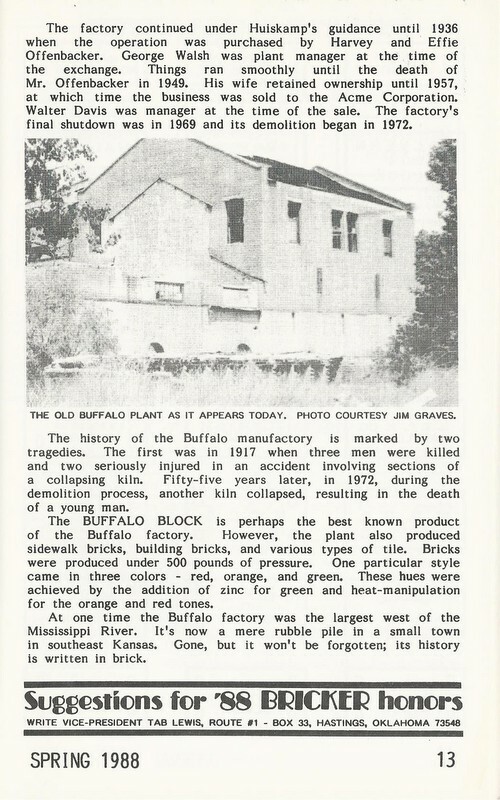 In 1983, the City of Buffalo obtained a lease from Justin Boot Company and made the plant its primary source of water. a centennial project of Buffalo Seniors Citzens, Inc.